Maxforce FC Magnum Roach Gel Bait is for serious roach control, supplement the roach control program with FC Magnum. Maxforce FC Magnum is the newest and fastest-acting roach bait ever by Maxforce. With Maxforce Magnum you get five times the fipronil, plus a new technology called ContactX which kills roaches by contact as well as ingestion. That combined with Maxforce Magnum's irresistible formulation that attracts even the most finicky roaches, and is the next generation in roach killer bait gel. Maxforce FC Magnum comes in a 33-gram syringe, with 10% more bait than other bait gels that only come in 30 gram sizes. 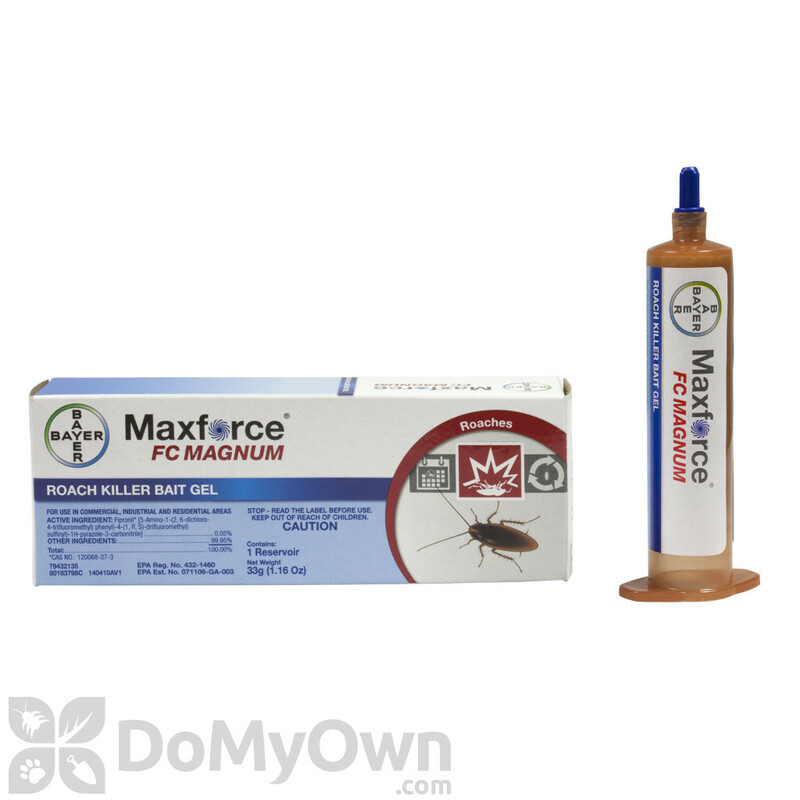 Whether roaches eat it, touch it or share it, Maxforce FC Magnum kills more roaches faster than any other Maxforce product. One plastic plunger is included per order, not per tube. Good IPM program does rotate baits (bait with different active ingredient) as roaches may not be attracted to the bait matrix of what is being used anymore. 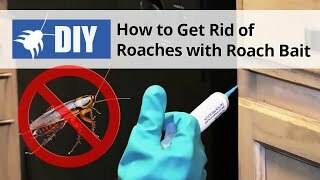 This video shows how to get rid of and kill roaches with a proper roach control bait treatment. Learn the proper way to bait for roaches in your home, just like the professionals! Maxforce FC Magnum roach bait gel is the newest bait from Maxforce by Bayer. It has the same great active ingredient as the other Maxforce products - Fipronil. Only this time, you get five times the active ingredient, plus a new technology called ContactX that kills roaches even when they just touch the bait. Other roaches touch or eat the dead roach and spread the bait again, controlling the entire colony, even the roaches you can't see. For serious roach control, supplement your roach control program with Magnum. The active ingredient Fipronil is in the Phenylpyrazole family of insecticides and is used in many products when a delayed kill is desired, such as ant and roach baits. Fipronil disrupts the insect central nervous system, causing hyperexcitation of nerves and muscles. Maxforce FC Magnum still has a delayed kill to allow bait to be passed to other roaches, but it moves more quickly than baits with less active ingredient for faster clean-out. Results will be evident as quickly as overnight (complete control will vary with level of infestation, overall sanitation, and other control methods used). 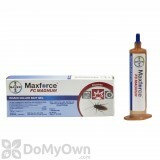 Use Maxforce FC Magnum as a crack and crevice or spot treatment for almost any roach infestation. Because Magnum has more active ingredient than other baits, it is ideal for heavy infestations, larger roaches, or more sensitive areas where other control methods such as sprays may be difficult. Maxforce FC Magnum stays effective up to a year after application, so it is also appropriate for quarterly or other maintenance programs in high-risk areas, such as apartments. Maxforce FC Magnum can also be used to control adult stages of many stored product beetles. Use Maxforce FC Magnum as a spot or crack and crevice treatment for indoor and outdoor control of listed roaches and stored product pests. Application rate varies according to the level of infestation and species to be controlled. Apply gel as round spots or thin beads into cracks and crevices or as a spot treatment. Place bait close to cockroach harborages, foraging and feeding areas such as corners and cracks and crevices. Numerous smaller bait placements provide faster control than fewer larger placements. In cases of severe infestation and areas with excessive clutter or alternative food sources that cannot be eliminated, use the higher rate of application. Pest population reduction will be apparent within 1 day for German roaches and 3-4 days for American roaches. Prior to using, gel may need to be shaken well if any separation has occurred. Unscrew the black cap (or break off the tip) and replace with included open tip. After use, replace the black cap before storage. Always read the product label completely before use. Each 33 g tube yields approximately 33 bait placements and treats 11 to 44 square yards, depending on infestation. Place bait under baseboards, sinks, countertops, seats, around water pipes, water heaters, dishwasher equipment, in crack and crevices as well as voids where insects harbor. Inspect bait placements and reapply as needed. Stored Product Pests: After removing infested foodstuffs and cleaning up spilled foodstuffs and dust, applications of this product will kill adult stages of beetles remaining in area. Apply in voids, cracks and crevices, behind and under cupboards, and other difficult to reach areas where insects may hide. Application rate is dependent on level of infestation. Food/Feed Handling Establishments: Apply only as a crack and crevice treatment in food/feed handling areas. Do not apply to areas that are routinely washed, exposed surfaces, or in ways that will contaminate food/feed, utensils or processing surfaces. Apply bait in small amounts between different elements of construction, between equipment and floors, openings leading into voids and hollow spaces in floors, walls, ceilings, equipment legs and bases, around plumbing pipes, doors and windows, behind and under refrigerators, cabinets, sinks, closets, stoves and other equipment where cockroaches hide. Inspect bait placements and reapply when necessary. Place bait in areas adjacent to structures where large roaches may nest or breed. Apply bait to potential points of insect entry, such as eaves, sills, and expansion joints. Apply bait in protected areas whenever possible. Environmental stresses such as direct sunlight and water will reduce the residual effectiveness. Priority treatment areas may be identified by visual inspection of such areas listed above or aided by trapping techniques or spot flushing. Bait may also be applied in reusable bait stations to protect from weathering and contaminants. Five times more active ingredient than other Maxforce baits. 10% more bait in each tube. ContactX technology kills roaches not just by ingestion, but also by contact. Attractive to roaches up to a year if not contaminated. No vapor, fumes, or odor. Low toxicity to people and pets, ready-to-use and easy to apply. Store out of extreme temperatures. Use within 2 years of purchase. Do not use sprays, heavy detergents or cleaners near baits as this can make baits less attractive. Sanitation should always be the top priority when treating for roaches! For more information on how to get rid of Roaches, see our Roach Control page. Apply bait away from air currents to prevent drying. Avoid placement on paper, cardboard, or other porous surfaces such as unsealed concrete. Good programs rotate baits to avoid resistance. Change baits every few months or alternate with different bait (and different active ingredients) for best results. May stain textiles, fabrics, or porous surfaces. Do not apply bait to areas where the temperature exceeds 130 degrees F as bait may run. Apply bait using included plunger or with a bait gun such as the Maxforce Professional Bait Gun. 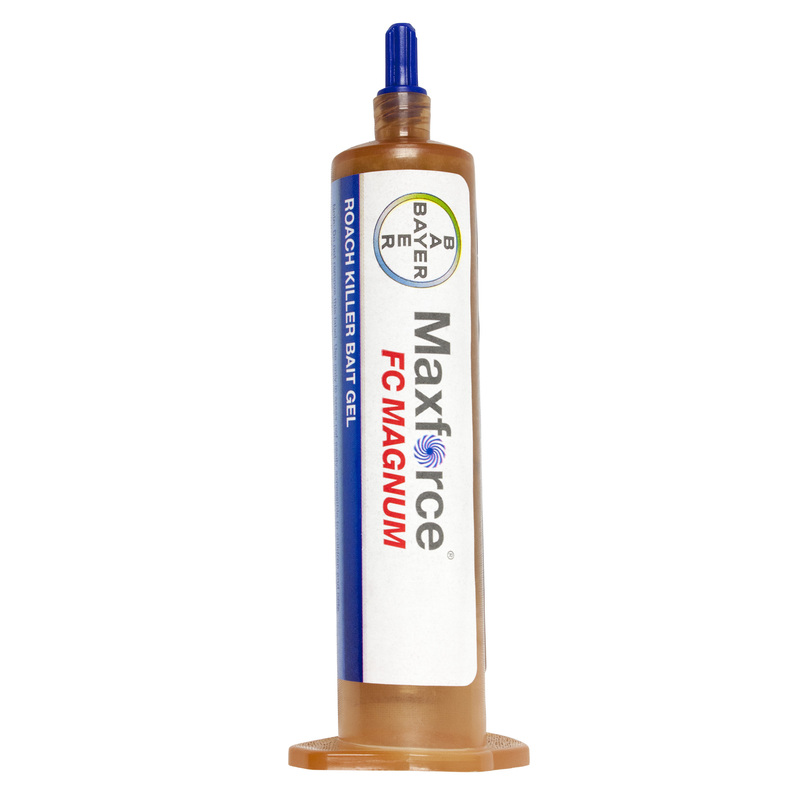 After trying several extermination methods to treat a major infestation, Maxforce FC Magnum is the only product that has worked. I would come out to the kitchen at night and find hundreds of German cockroaches having a party. After 3 days, the only roaches I've seen are belly up, twitching on the floor. If anything, the only problem with this product is that it kills them too fast. Big results for a big problem. This stuff really works! I bought Maxforce FC Magnum along with Roach Control Kit # 1 (which has the much needed birth control and gel bait) and the Maxforce 72 pack bait stations. The best $$ I've ever spent! I saw fewer roaches in 3 days, and none, yes none, in a week! I still do surprise spot checks at 2 AM in the kitchen & no more roach parties! The tubes are smaller than I expected but they pack a powerful punch. Whatever you do, buy the birth control so they can't reproduce! Thanks to rep. "Philip"! Maxforce FC Magnum is excellent. It has worked each time I have used it. My only drawback is that I can't find it locally to buy it. I strongly recommend this. Buy it and you won't regret it. Good luck. I had always considered myself a very clean person, but I live in a multi-unit apartment complex. A few weeks ago my kids started seeing little black bugs hanging around our 30 gallon fish aquarium. To my surprise they were baby German cockroaches. I flipped out! I started doing research on the Internet and came across this website. Maxforce FC Magnum seemed to be the one for me. Great price, easy to use, and excellent customer service. I used the product as directed, and at night you could see them eating it up. Three days later NO roaches at all. No roaches ANYWHERE!! Amazing product. Highly recommend. How can I get roaches out of my electronics? I have roaches in some of my electronics, some newer stuff, still under a warranty, and don't want to void it by opening it up. For example a Playstation 3. What is the best thing to do to get them out of there? You can place a roach bait gel such as Maxforce FC Magnum on a piece of tin foil or plastic wrap and set it on and under the electronics. The roaches should be attracted to the gel, eat it and this will help kill the roaches. It will not stop them from dying in the device however. You could also surround the device with insect glueboards to trap the roaches as they leave to feed. Unfortunately there is nothing that we can recommend to spray into electronics because of the chance something could be damaged. We have a large roach infestation in an empty house. What should we use? I have German Roaches in my rental property. We have thrown out the refrigerator and stove. There is nothing left in the house. We have bombed with 3 different types and still have them rain down on us when we open the front door. They are collecting in the upper corners of rooms and on any door that remains shut they get on the top. I have bought new appliances but cannot put them in until the roaches are gone. Please help. We are in Orlando, Fl. Most bug bombs do not leave a residual behind so it will only kill the roaches that are out in the open when the bomb is set off. Before starting a roach treatment program you must thoroughly sanitize the house. Even the best insecticides on the market cannot overcome poor sanitation. You must use products that will leave an active residual behind and products that will eliminate roaches where they hide. You will need to use 3 products together to eliminate roaches. You will need to use an insecticide such as Cy-Kick CS mixed with an insect growth regulator such as Gentrol IGR around door frames, window frames, baseboards, under and behind appliances and counters and any other cracks or crevice where roaches harbor. The other product you will need is a roach bait gel such as Maxforce FC Magnum. 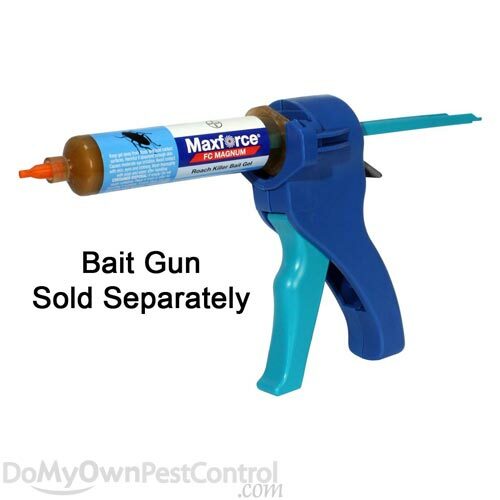 Place the bait gel in areas where insecticide sprays would not be appropriate, such as in cracks and crevices on counter tops, in cabinets, in drawers, around sinks and in cupboards. It is important to remember that a large roach infestation did not pop up over night and it will not go away over night. It can take several months to get rid of a large infestation. How do you use the Maxforce FC Magnum in the reservoir if it does not come with a plunger? The actual box of Maxforce FC Magnum does not come with a plunger, but we provide one with every order free of charge for you to push the gel out. We also sell the plungers individually if you would like additional units. If you happen to lose the plunger that comes with your order, you can always use your finger or a highlighter marker to advance the gel out of the tube. Do cat litter boxes attract German roaches? Cat litter boxes that are not cleaned daily could indeed attract roaches. Be sure to follow the instructions on the litter product that you choose to learn how frequently you should change the litter. What is the best bait brand for Roaches? I treat local stores in my area. For example Dunkin Donuts and average Pizza place etc. I have tried using Talstar 1 but does not seem to get rid of the roaches and i keep getting call backs. So i was wondering which gel bait would be the best to use for my situation. Thanks a lot for taking your time out and sparing your knowledge to me and others. We would recommend baiting very heavily using Maxforce FC Magnum roach gel. Small dabs in a ton of places is the key. In addition you should use Gentrol Point Source, which is an IGR which will prevent the roaches from maturing and reproducing which in turn will slow down the life cycle and the numbers of small roaches you are dealing with. You should use both the gel and the gentrol point source in places off of the ground. Around the floor area and underneath things you should apply Phantom liquid which is a non-repellent product that roaches can pick up when they walk over it and transfer it to other roaches in hiding areas that you cannot reach, like inside wall voids. The use of these three key products should start to knock down large numbers of roaches unless there is some major sanitation issues that have not been corrected. Obviously any food or water sources that are not cleaned up and taken care of will prolong the problem indefinitely. Please let us know if you have any further questions.